Wishing everyone a very happy and prosperous Chinese New Year and Gong Xi Fa Cai, 恭喜发财! I will be on my way home to Malaysia in less than 36 hours. I’d like to inform you that my kitchen will be closed for at least 3 weeks…but I promise I will share my eating adventures with you here on Rasa Malaysia. Perhaps it’s time you try out all my recipes. Again, Happy Lunar New Year, happy eating, and have a good one! have a happy and prosperous year ahead! Welcome home in advance! And happy new year to you too!!! I have a shorter break than you. I also wish you a very Happy and Prosperous Chinese New Year!!! Gong Xi Fa Cai, Rasa Malaysia! Enjoy your time at home! This question is off topic and there’s no hurry at all but when you get a chance, I would love to know: is there a particular cookbook or website that you recommend for Nyonya Kuih recipes? I know they are notoriously labour-intensive but I am eager to try something one of these days. Happy CNY & have a safe trip home & back. Happy Chinese New Year, and can’t wait to see the “street vendor” pictures you’ll have when you return! We’ll miss you Bee! Everyone – thanks for your greetings. I think my site is too red now…too Chinese New Year!! Team BSG – Get ready for a big heart attack when we meet. Kekekekekeke. Claude – no worries. Not only will pictures be uploaded, I am also going to post some Antony Bourdain style movie clips of my trip and eating adventures…stay tuned! Meena – OK, no problem. Nasi Lemak and Mee Goreng x3 please. Cheese – yes, I saw it, thanks and will try post CNY. Just wanna wish u n ur family, Gong Xi Gong Xi Gong Xi! Thanks for sharing ur recipes…it’s been great! Hv great time eating, gambling and soaking up the m’sian heat! keong hee huat chai to you, bee (this is the true hokkien greeting). Gong Xi Fa Chai! May there be abundance of blessing, prosperity and longevity for all! Wishing you a great journey home and a warm reunion with your families and friends. I look forward to see your eating adventures in Malaysia. 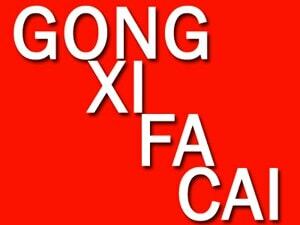 Gong Hei Fatt Choy to you and enjoy your trip back to Malaysia. Have a safe and enjoyable trip home. Gong Xi Fa Cai – Xin Nian Kuai Le! Wishing you an enjoyable vacation.